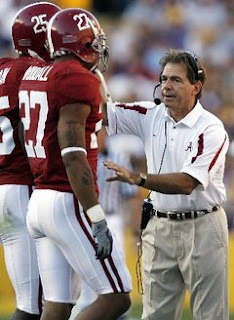 Nick Saban was asked at the 2009 SEC media day about the spread offense he's seeing so much in college, and you could tell by his answers he was focused the most on the University of Florida style of spread offense, featuring a dual threat quarterback. "NFL Defenses Are Too Fast For The Spread Offense Run Game" - If I have to read that one more time I may have to call Dell for a new computer screen, because this one may take 'the leap'. 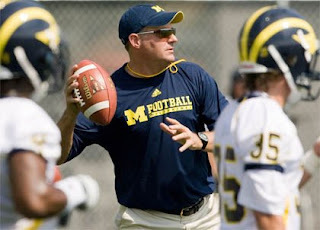 Please, enough about the NFL defenses being too fast... all your doing in the shot spread option offense is adding an athletic dual-threat quarterback to the equation, not re-inventing football! 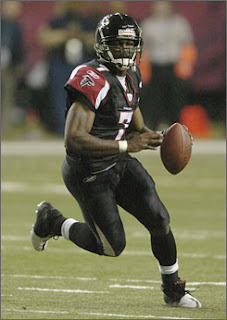 In 2006, Atlanta's Michael Vick became the first NFL quarterback to rush for 1,000 yards in a season. Where defenses 'not too quick' that year? No, Michael Vick was just quicker, and more agile, and more athletic... just like L.T. is at the TB position, Randy Moss is at the WR position, or any other superior offensive player. It kind of reminds me of the bully who you've never actually seen fight, but has the reputation of being the toughest guy out there... I think we may see pretty soon the NFL defenses reputation of "too fast for the spread run game, dual threat quarterback gimmick" be put to the test. Today, July 21 2009 must be 'Spread Offense Day' at ESPN.com. They released today a buffet style menu of articles dedicated to the spread offense in college football. A lot of good stuff from some great coaches on 'that dieing offense' ... HA! We thought it would be fit to put Coach Rod as the picture... still the 'Chairman of The Board' of the shot gun spread option offense.